We welcome spring with an important award. An award which goes to the Ondeck team and the industry’s professionals who chose Skipper ONDECK as their communication vehicle. A fresh breeze of renewal rustled through the several new sections of Düsseldorf’s International Boat Show. The 25th Dubai International Boat Show was a great success, a true magnet for thousands of people who appreciated the top notch organisation. Being readily associated with the sea and sailing, bravery, seamanship and ocean sailing, Rolex is not just a sponsor; it has become a companion who has built a strong relationship characterized by mutual progress. The much anticipated celebration of Greek yachting will be held for yet another year in Nafplion and is bound to attract a new record high of attendees. Amara, Oceanco’s newly designed and engineered 120-meter private yacht concept created in collaboration with Sam Sorgiovanni Designs, was unveiled by His Excellency Saeed Harib, Secretary General of Dubai Sports Council, Vice President and Chairman of Dubai International Marine Club - Mina Seyahi, and Senior Advisor to the Dubai International Boat Show. Perhaps one of the year’s most innovative and interesting creations. After her admittedly impressive appearance at last year’s boot, we simply couldn’t wait to see the new Sherpa at sea. This year we had the opportunity to travel on board and enjoy her exuberant interiors. 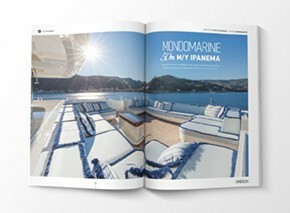 A semi-displacement 50m project by Mondomarine, engineered and designed by Hot Lab: yacht & design. From Monaco to Miami. 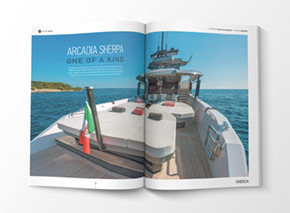 Signed by Aston Martin, the new speedboat chose the two greatest boat shows for her debut. Design Office Stirling & Co, the creators of this fine multi-awarded maxi, take us on a tour in the magic world of UNFURLED. One dive beneath the surface of the Red Sea and you’ll discover why it is one of the world’s most breathtaking diving destinations. Boasting unique performances, the 1st international golf tournament was a true success. Make yourself comfortable at those most coveted tables on the street outside bars and restaurants which give you yet another reason for sweet spring gallivanting. Nafplion combines a set of enchanting landscapes. Modern and classic, cosmopolitan and romantic, this favourite destination for all seasons will make you want to come back. At the heart of the world's fastest and most powerful luxury diesel SUV lies an all-new, technologically advanced, triple-charged, 4.0-litre, 32-valve V8 engine.